Former Yankees outfielder/DH Hideki Matsui holding the framed jersey he wore during the 2009 season bearing his No. 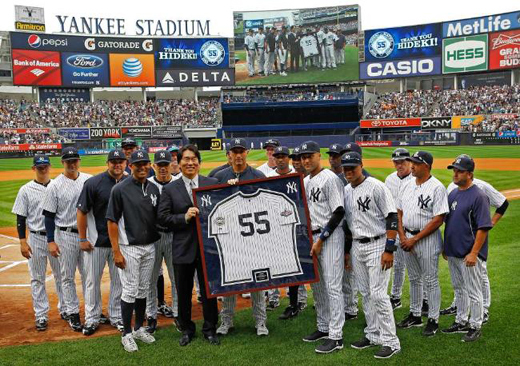 55 alongside the team after officially retiring as a member of the Yankees prior to the victory over the Rays on Sunday. NEW YORK — The camera flashes fired without pause for more than a minute. A bank of TV cameras and photographers lined the back of a packed press conference room. And all the seats were filled, leaving reporters standing along the walls just to witness Hideki Matsui sign his final baseball contract. The 2009 World Series MVP returned to the Bronx to ink an honorary, one-day, minor league deal — then later his retirement papers — to officially end his career as a Yankee after he spent 2003-09 in pinstripes.